We have information you must know before you buy the Montero. See used Mitsubishi Montero listings in your area. The table below shows all 2002 Mitsubishi Montero specs by style, including MPG (fuel economy), transmission details, and interior and exterior dimensions. 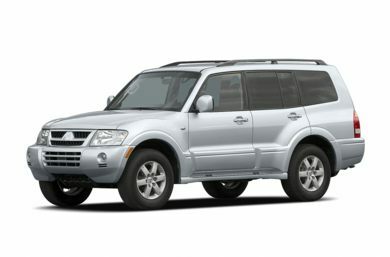 Additionally, find 2002 Mitsubishi Montero warranty and reliability information, such as limits on bumper-to-bumper coverage and major components. Fuel Tank 23.8 gal. 23.8 gal. Maximum Cargo Volume 96.4 cu.ft. 91.7 cu.ft. Exterior Length 189.2 " 189.2 "
Exterior Width 74.0 " 74.0 "
Exterior Height 71.3 " 71.3 "
Wheelbase 110 " 110 "
Front Tread 62 " 62 "
Rear Tread 62 " 62 "
Gross Vehicle Weight Rating 5,840 lbs. 5,840 lbs. Curb Weight 4,600 lbs. 4,735 lbs. Payload 1,300 lbs. 1,165 lbs. Max Trailer Weight 5,000 lbs. 5,000 lbs. Front Legroom 42.3 " 42.3 "
Rear Legroom 35.2 " 35.2 "
Front Headroom Standard:41.5 "Available:38.9 " 39.8 "
Rear Headroom Standard:40.6 "Available:37.7 " 38.0 "
Third Row Headroom Standard:37.4 "Available:35.3 " 37.4 "
Front Hiproom 57.7 " 57.7 "
Rear Hiproom 55.5 " 55.5 "
Third Row Hiproom 45.3 " 45.3 "
Front Shoulder Room 58.5 " 58.5 "
Rear Shoulder Room 57.5 " 57.5 "
Third Row Shoulder Room 54.7 " 54.7 "
Passenger Volume 105 cu.ft. 107 cu.ft. Interior Cargo Volume 42.1 cu.ft. 39.8 cu.ft. Interior Cargo Volume w/Seats Folded 96.4 cu.ft. 91.7 cu.ft. Below is the 2002 Mitsubishi Montero safety rating information and crash results as reported by the National Highway Traffic Safety Administration (NHTSA). The ratings are based on a star system and can vary by style.